Each year, I challenge myself to buy all of my Christmas gifts for $100 or less. This is something that I’ve been doing for most of my married life, and I’ve been married for almost 17 years. When we hit the holiday season, I make my kids promise they’ll stay off the website until after Christmas, so I can show you what I’m able to get on such a tight budget. If this is your first time tuning in for one of my Christmas Under $100 challenges, that $100 budget has to stretch to cover gifts for my husband and two teenage daughters, our extended family, all of our friends (and our kids’ friends), our awesome mailman and my kids’ teachers. This year, I’ve also decided to include advent calendar gifts. My mom used to fill an advent calendar for the kids, but as the number of grandkids in the family grew, the tradition sort of fell away. So, this year, I’m bringing the tradition back. It’ll be a fun surprise for my kids, since they don’t know I’m doing it. Update: I ended up spending $1.07 on the kids’ advent calendar this year. They alternated every other day, so I picked out 12 things for each of them. 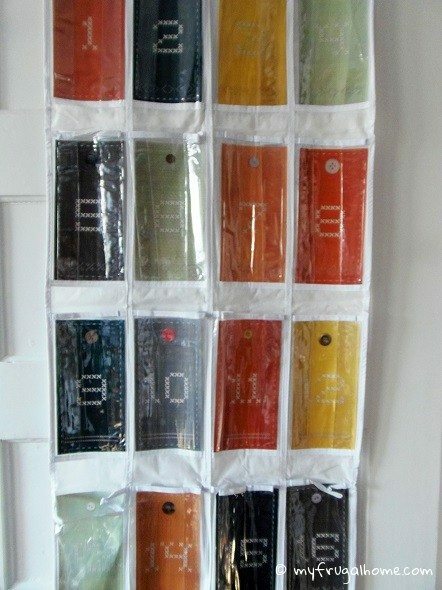 This is our advent calendar, by the way. It’s made from an over-the-door shoe organizer, so it has nice big pockets for gifts. If you want to make one just like it, you can print the number cards here. I decided it would be fun to get my daughters each a new pair of Christmas socks for each week in December. 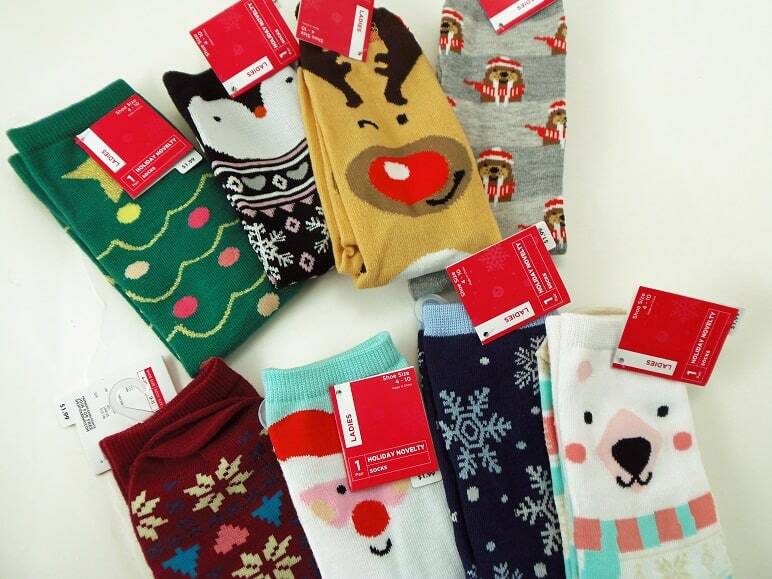 Sears has cute, inexpensive Christmas socks this year, so I used some of the Shop Your Way Rewards that I earn from playing the instant win games to pay for the socks. It took me a few weeks to earn enough points, but I managed to get all eight pairs for $.07 out of pocket. They would have been completely free, but I got a notification that the reindeer socks (my favorites) were in low stock, so I went ahead and ordered them before I had enough to cover the full cost. I’ve always played the Shop Your Way instant win games on my laptop, so I never saw any reason to download their Win It app, but I finally downloaded it last week, and now I really wish I’d done it sooner. It has special bonus games that you don’t get on the desktop version, and you can set notifications, so you don’t miss the bonus games or the Wild Wins. It’s not unusual to win $4 or $6 at a time when you play the bonus games, so now I’m wracking points up much faster. 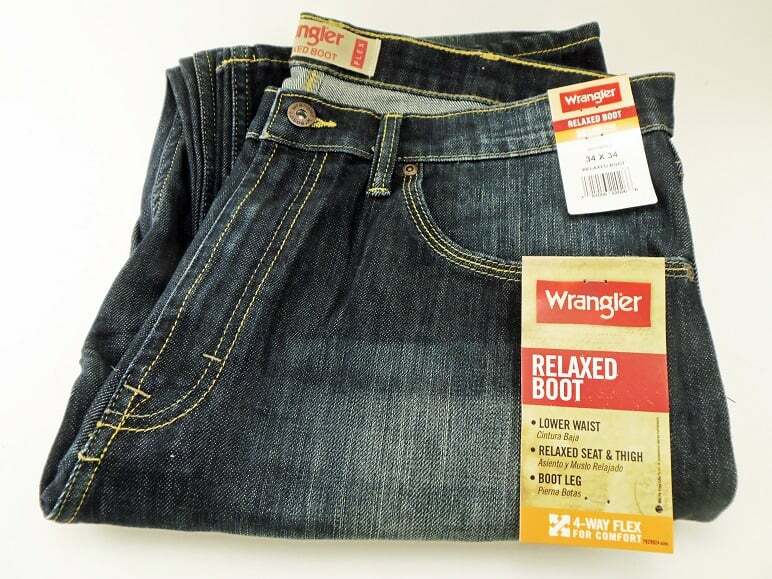 Unfortunately, our local Sears will be closing in February, so this will likely be the last year that I can include Shop Your Way in my Christmas-Under-$100 strategy, but I plan to make the most of the program while it’s still around. Free samples are another prong of my stuff-the-advent-calendar plan. I’ve been requesting things that I thought the girls would enjoy all year. 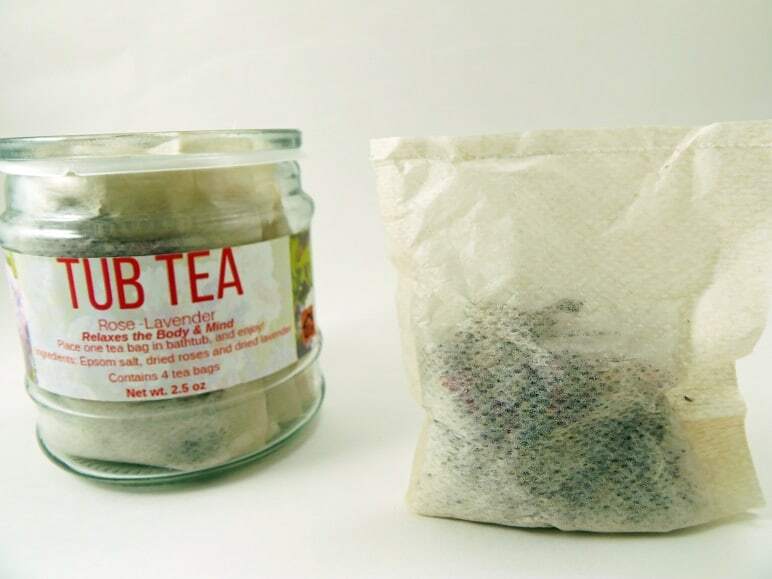 So, this peach tea bag and clay mask will fill two of the pockets. 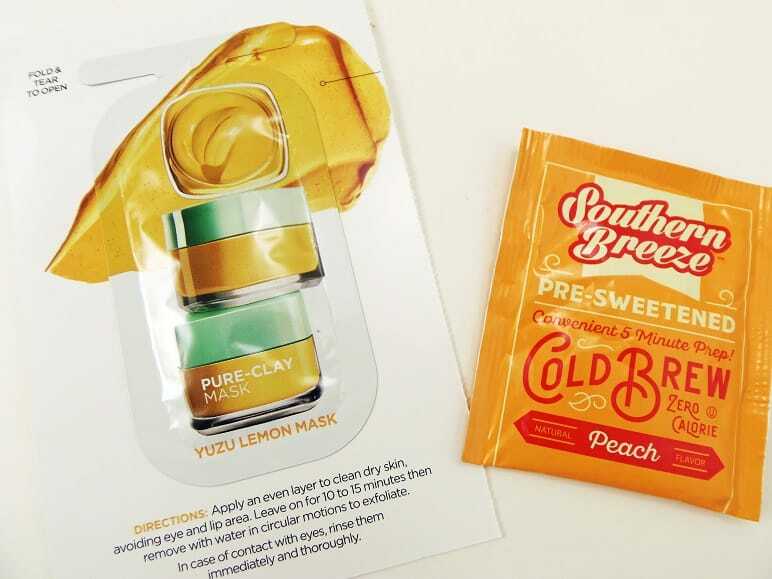 I also got another free face mask that I forgot to photograph. Here’s the rest of the stuff that I got to fill their pockets. The Carmex lip balm is a full-size sample that I requested. The Welch’s fruit snacks were paid for with Walgreen’s Register Rewards. 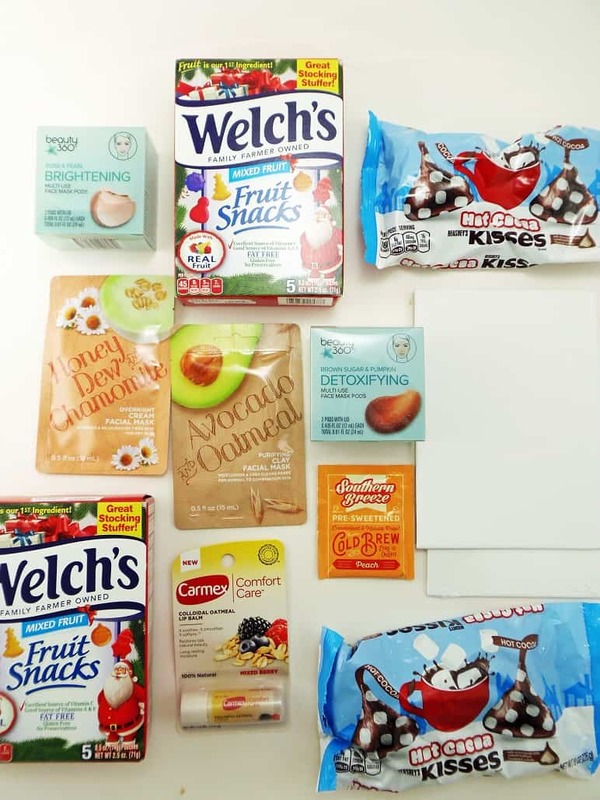 The face masks and Hershey’s Kisses came from CVS, and were paid for with ExtraCare Bucks. 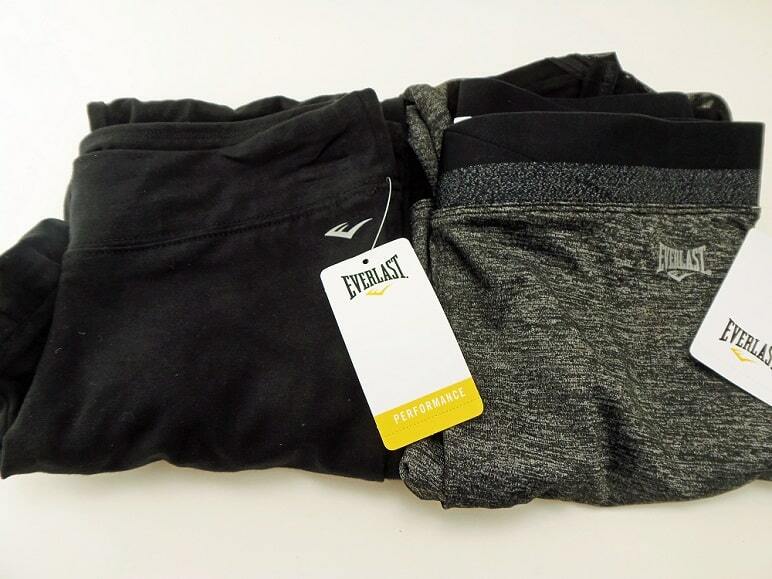 The Kisses will be divided between four pockets. And the little canvas boards came from Dollar Tree. They came in a two pack, so they were just $.50 each. Now that I have their advent calendar taken care of, let me show you the Christmas presents that I got for them. These are all gifts for my oldest daughter, who’s 16. 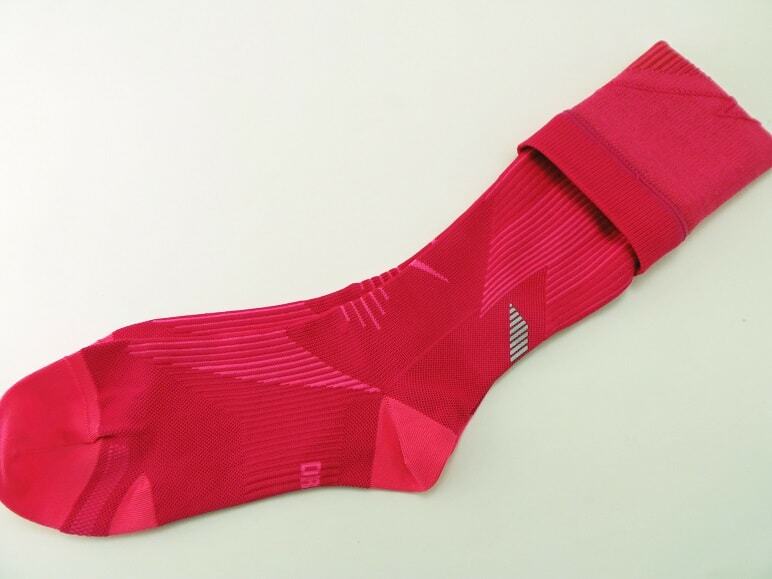 The cabin socks were paid for with Shop Your Way Rewards. The face masks are a repeat from last year, since they were such a hit. I paid for them with ExtraCare Bucks. I got the colored pens for free, thanks to an eBay promotion. They had a promo code earlier this year that got you $5 off any purchase, so I used it to get these pens, plus a stocking stuffer that I’ll show you in a minute. The little stretched canvas came from Dollar Tree, and it’s the only thing I paid for in this batch. So, that brings my total up to $2.07 so far. 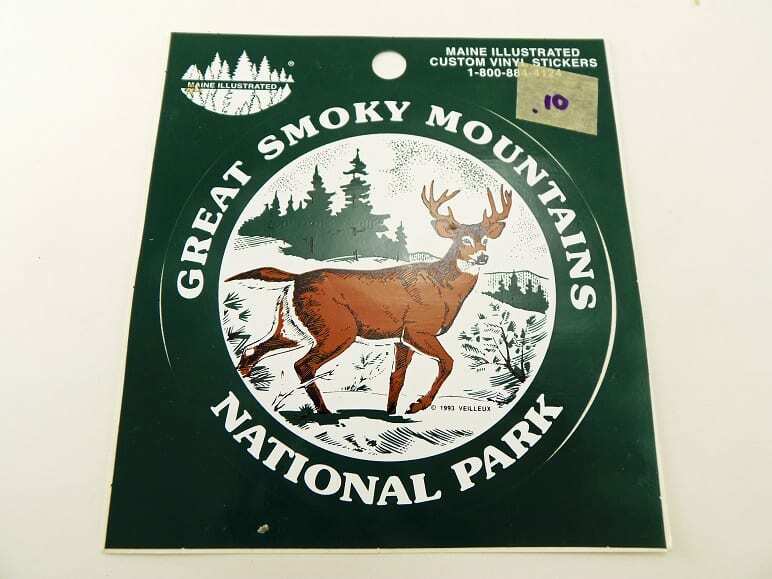 … and this Great Smoky Mountains National Park sticker for $.10 at the same rummage sale. This is actually something that’s been on her wish list. Both of my daughters collect stickers from the National Parks they’ve visited. They use them to decorate their water bottles. 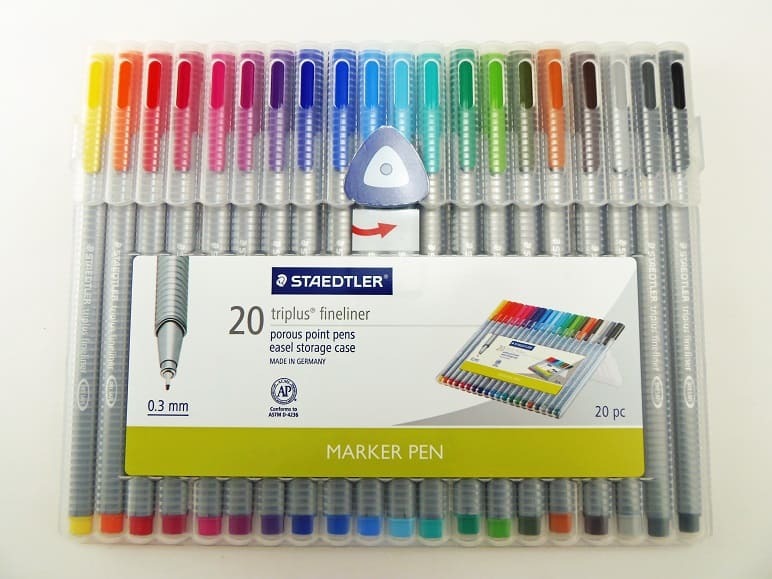 She asked for some fine-point colored pens for sketching, so I bought her this nice set of Staedtler pens (free after a 20% promo code and Office Depot Rewards. 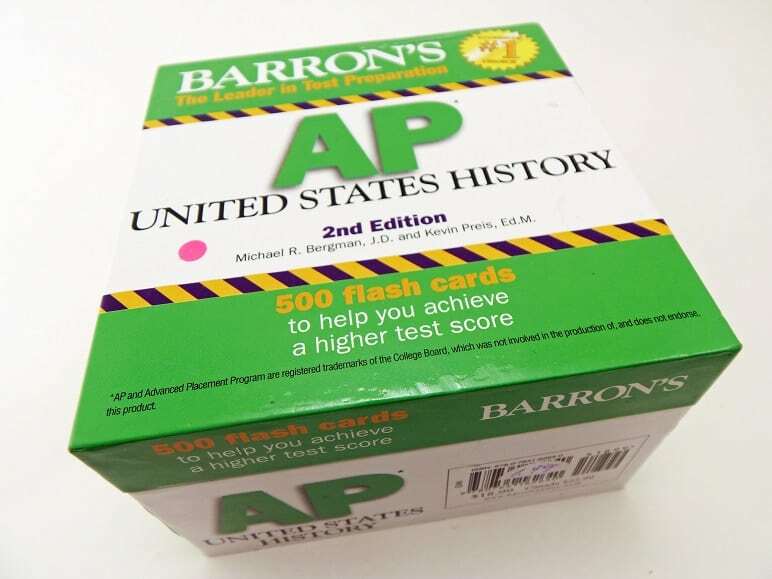 My husband spotted this set of AP U.S. History flashcards in a thrift store, and paid $1.99 for them. She’ll be taking the exam in May, so I know she’ll be glad to have these. He also found her a light box in another thrift store for $4.99. I’ll photograph it one day when she’s in school. And here are the stocking stuffers that I rounded up for her. The chocolate coal is a tradition at this point. I try to put it in their stocking every year. This time it was paid for with Walgreens rewards. 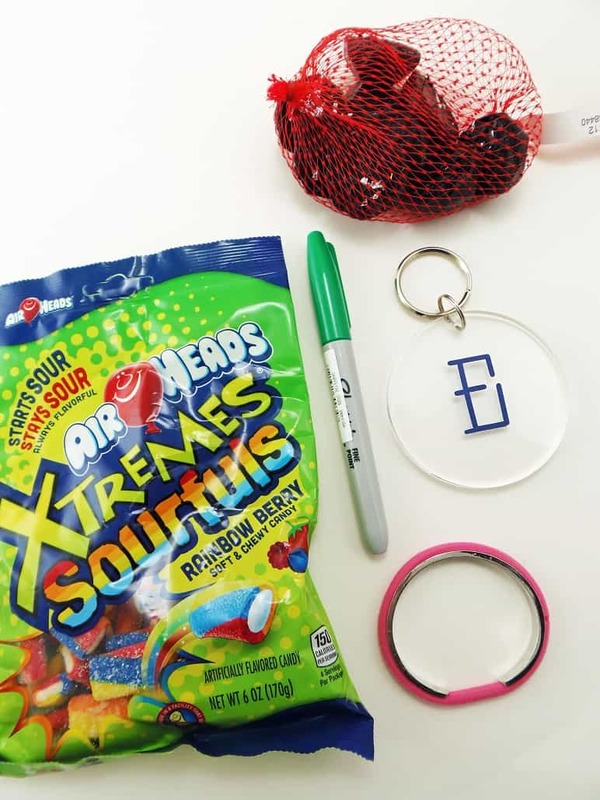 The Airheads were a Kroger Friday Freebie, and the “E” lucite keychain was a $.25 find at a church rummage sale. The Sharpie marker was paid for with Office Depot Rewards. I had a bit left over after I bought her pen set, so I used it to get a Sharpie for each of their stockings. And the pink bracelet at the bottom is a hairband bracelet. I bought them each one (free with the eBay promo code), so I wouldn’t have to get after them for wearing tight hairbands on their wrists anymore. 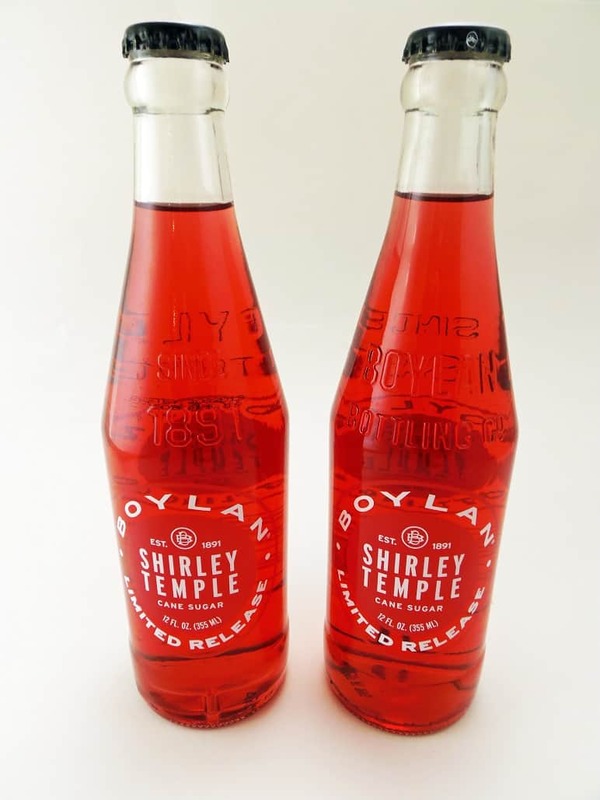 I’ll be sticking one of those Boylan Shirley Temples in each of my daughter’s stockings. I found them on clearance at Kroger for $.59 each. They first discovered Shirley Temples at my sister’s wedding several years back, and they’ve loved them ever since. 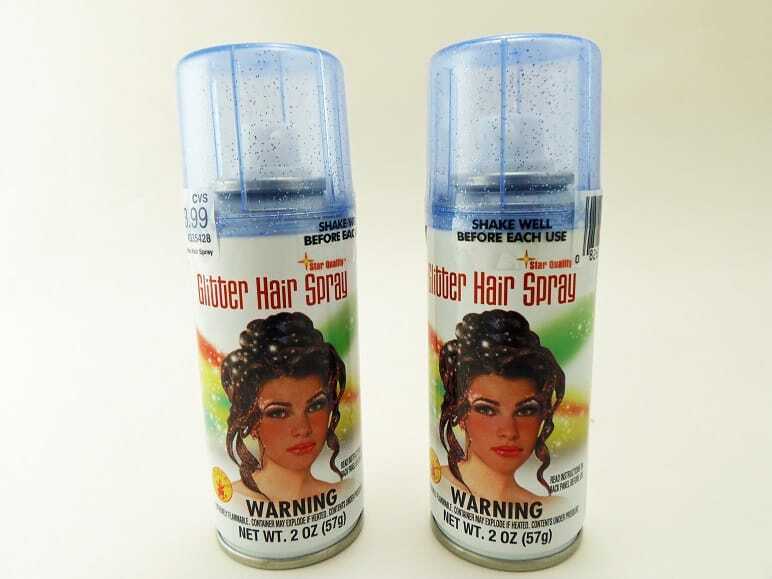 I found the glitter hairspray in the Halloween clearance at CVS. It was 90% off, and I used rewards to pay for it. I figure they can use it next Halloween, or maybe for a school dance, if they do a fancy updo. One of these bottles will go in each of their stockings. 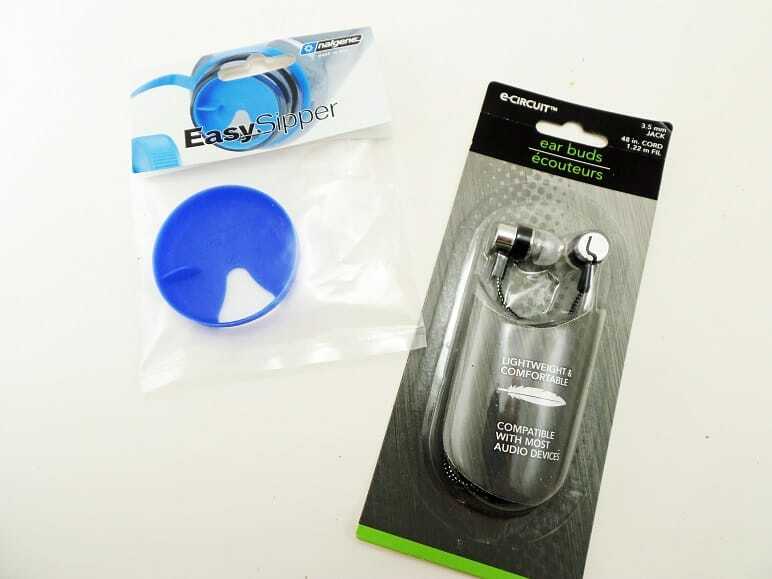 Teenagers destroy earbuds, so I bought them each a replacement pair at the dollar store. 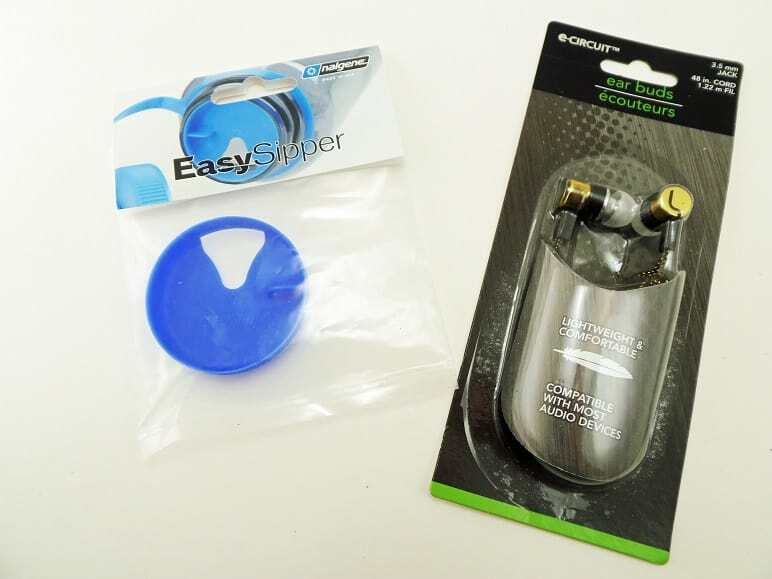 That little blue piece of plastic is an easy sipper add-on for her Nalgene water bottle (paid for with an Amazon gift card that I earned from TopCashBack). It makes the hole smaller, so you don’t pour water all over yourself every time you take a sip. It’s something the girls asked for. My husband pointed out how ridiculous it is that you have to buy an extra piece for the water bottle to make it work the way it should. Can’t say he’s wrong about that. Combine her gifts and stocking stuffers with their advent calendar gifts, and that brings my total to $11.99. These gifts are very similar to some of the gifts that I got for my oldest daughter, and they all came from the same sources. 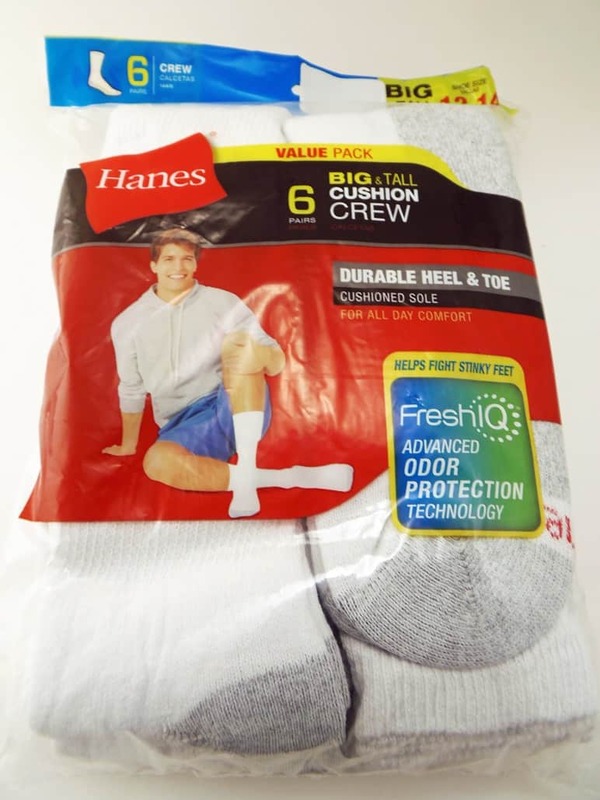 But just to recap: the cabin socks came from Sears, and were paid for with Shop Your Way Rewards. The face masks came from CVS, and were paid for with ExtraCare Bucks. The little canvas came from Dollar Tree, and the colored pens came from the eBay promotion. My husband and I each have an account, so we were both able to use the promo code. 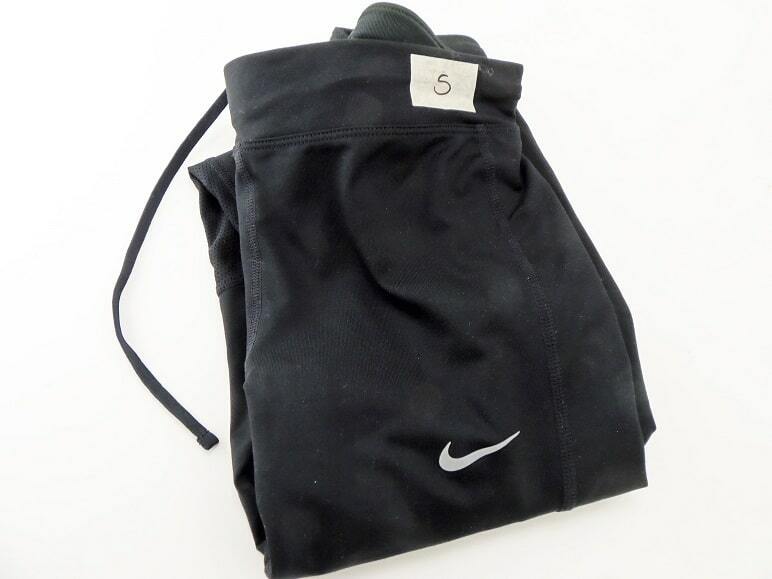 and a brand new pair of Nike socks at that same sale for $.10. Major scores! 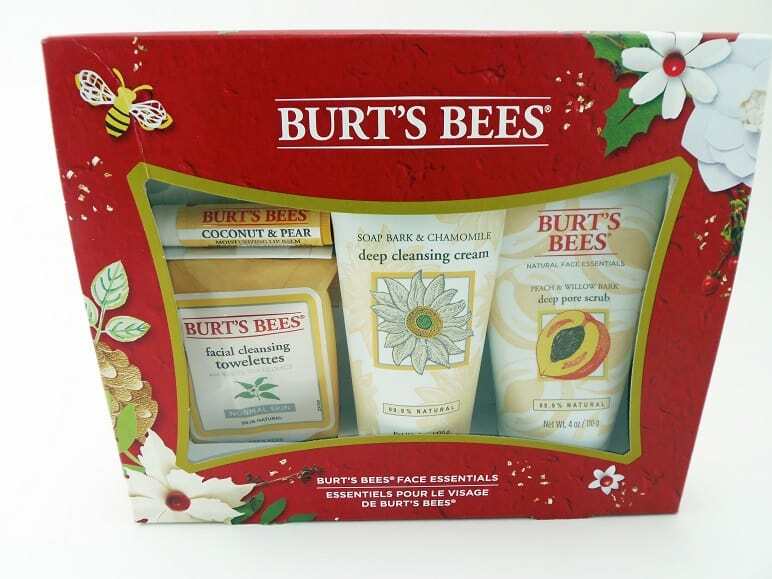 I bought this Burt’s Bees gift set after Christmas last year for $4.48. It includes four full-size items, so it was a great deal. And here are the stocking stuffers that I got for her. The Sour Patch Watermelons were a Kroger Friday Freebies. The chocolate coal and Russell Stover chocolate were free after Walgreens Register Rewards. The “L” keychain was $.25 at a church rummage sale. The Sharpie was free after Office Depot Rewards, and the hairband bracelet was free from that eBay promotion. 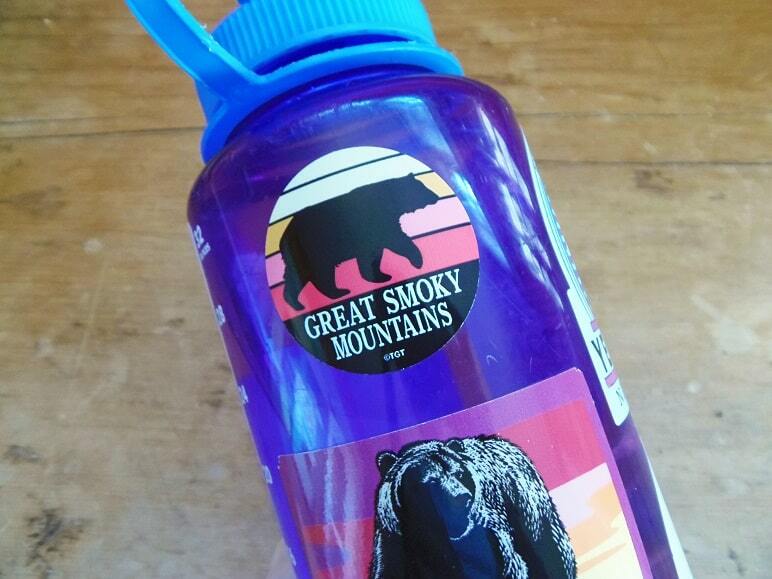 I also got her a pair of earbuds from the dollar store, an Easy Sipper lid for her water bottle (paid for with a gift card that I earned through TopCashBack) and a Great Smoky Mountains sticker ($1.60). Just to remind you, she’ll also be getting one of those Shirley Temple bottles and glitter hairsprays in her stocking. When I add her gifts and stocking stuffers to my total, that brings me to $25.08. Now, let me show you what I got my husband. 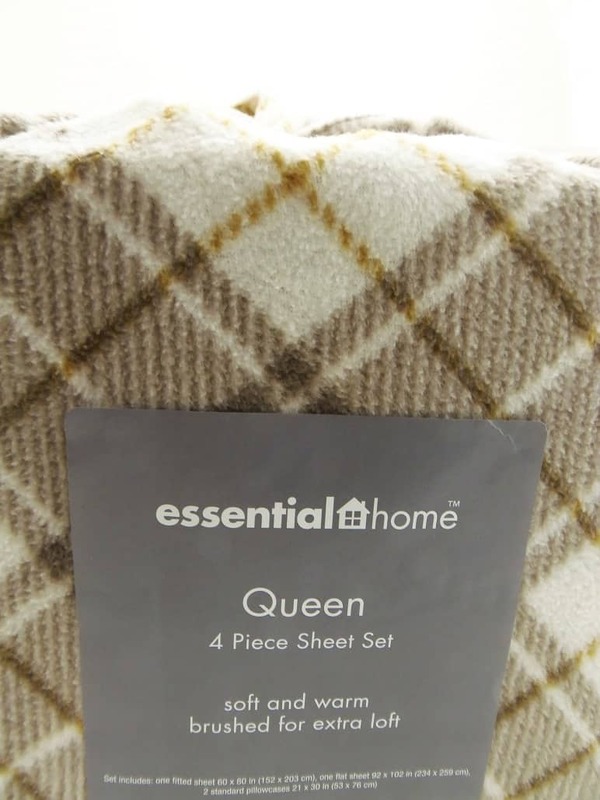 I used Shop Your Way Rewards to get this fleece sheets set from Kmart. These are going to be great this winter. and a pack of socks. 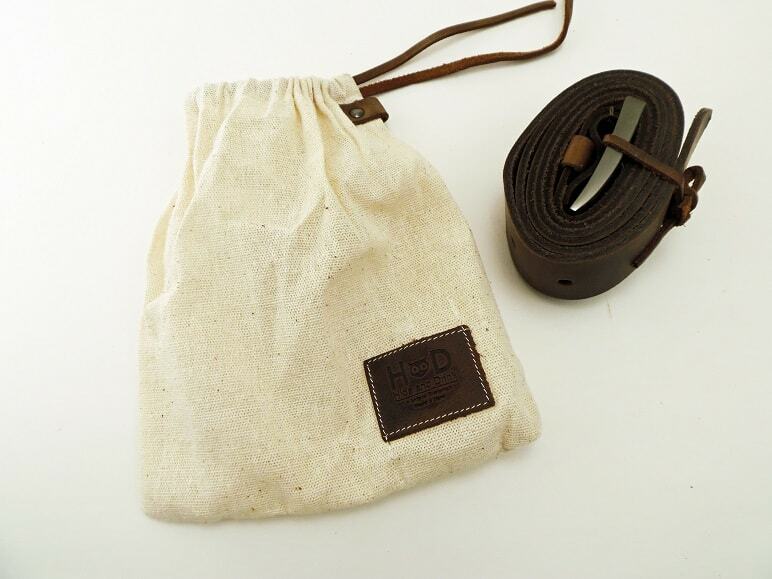 His leather belts are pretty worn out, so I ordered this nice, handmade leather belt on Amazon. I used a gift card that I earned from TopCashBack and a gift card that we received as a gift from our advertising network to pay for it. Now, let me show you the stocking stuffers that I’ve gotten for him. 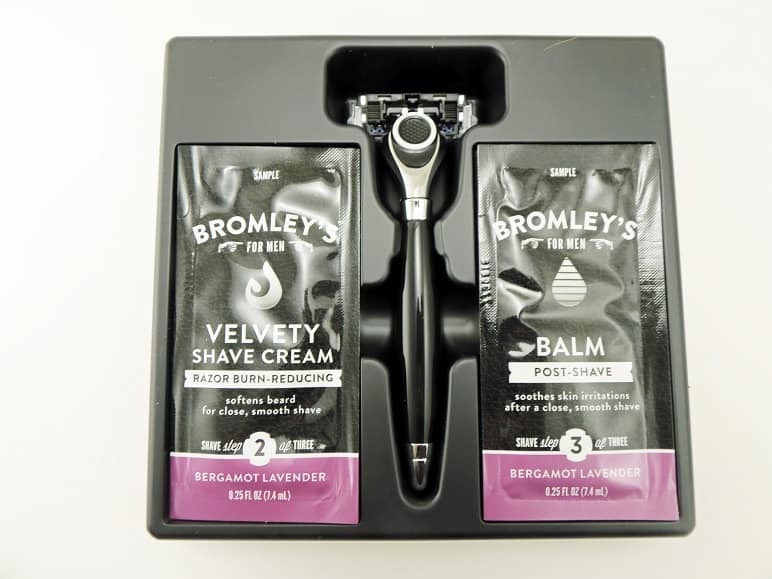 This shaving kit was a free sample that I requested. Isn’t it a nice freebie? 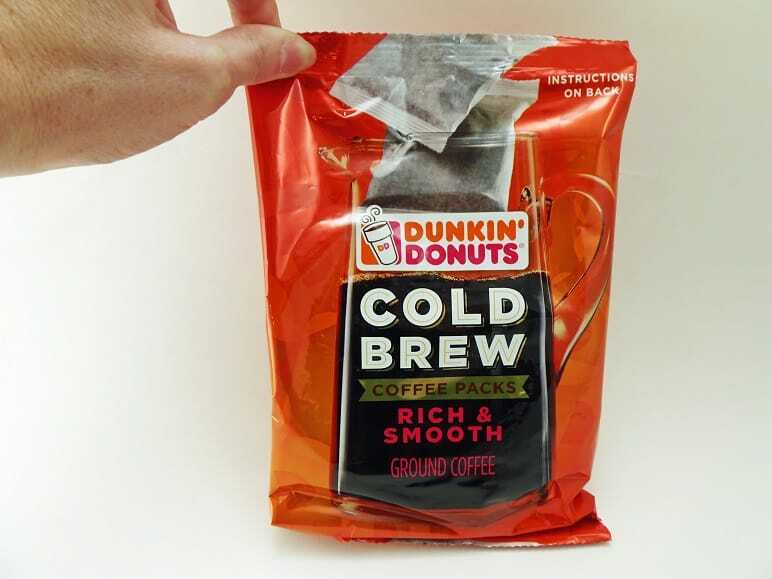 And this coffee sample was a freebie, too. It’s also a generous size. 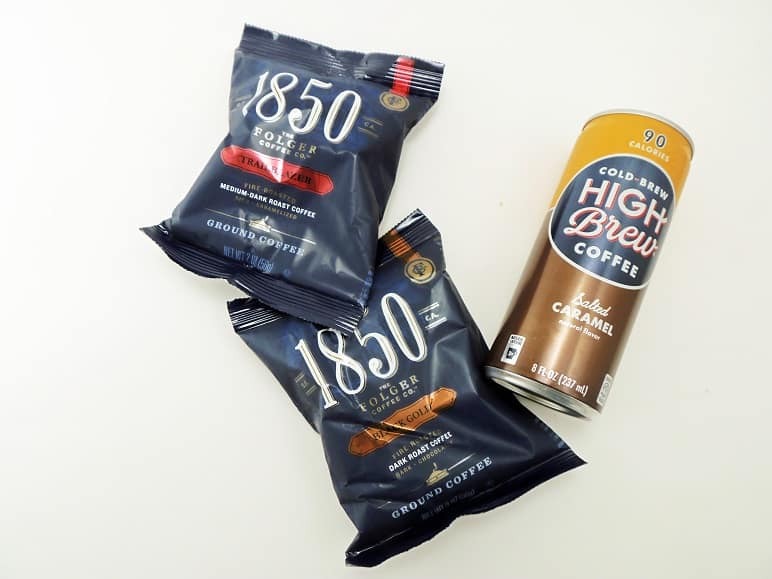 These bags of 1850 coffee were also free samples, and the can of salted-caramel coffee was a Kroger Friday Freebie. Despite finding all these nice things, I didn’t end up spending any money on his gifts or stocking stuffers. I also got these photo bookmarks for free from Walgreens (with a promo code). 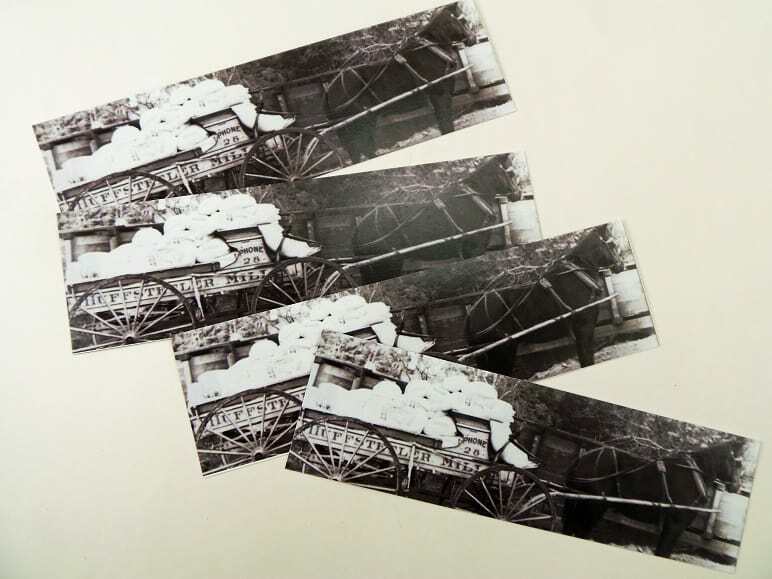 It’s a picture of a horse and cart from a local mill that was owned by Huffstetlers. I stuck one in everyone’s stockings. Now, let me show you the gifts we gave our extended family this year. This is the gift that we gave my dad. We used a Snap-on lunch cooler ($1 at a yard sale) as a gift basket. Then, we filled it with a bag of sinus shower steamers and a heating pad. It cost me $2.56 to make the shower steamers and $3.26 to make the heating pad. 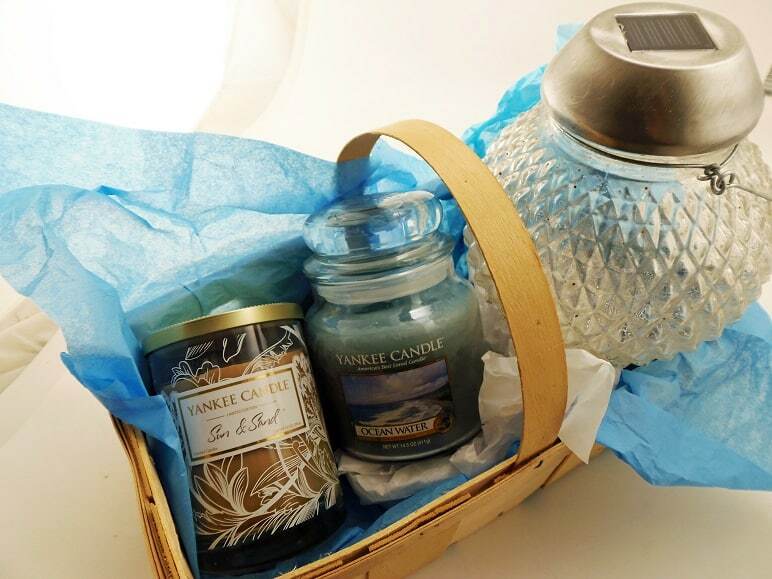 This is the gift basket that we put together for my mom. Last year we made her one of our solar lights. She’d been hinting that she wanted more matching ones, so we made her another one, and paired it with a couple of Yankee Candles that were given to us. Total cost: $2.50 (which includes a shepherd’s hook for the solar light, that isn’t shown here). 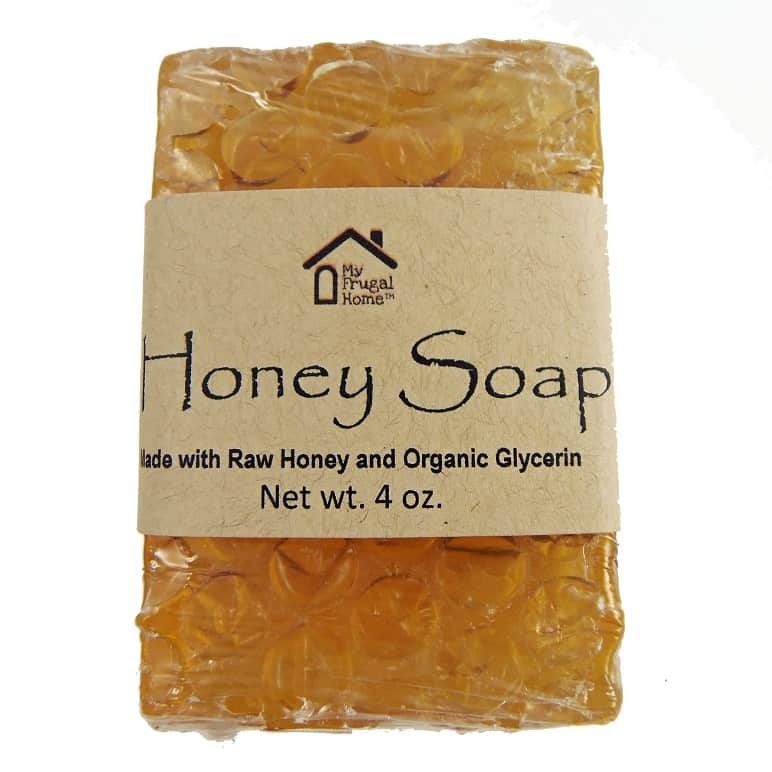 We gave my mother-in-law a jar of my tub tea ($1.59) and a bar of my honey soap ($1.34). 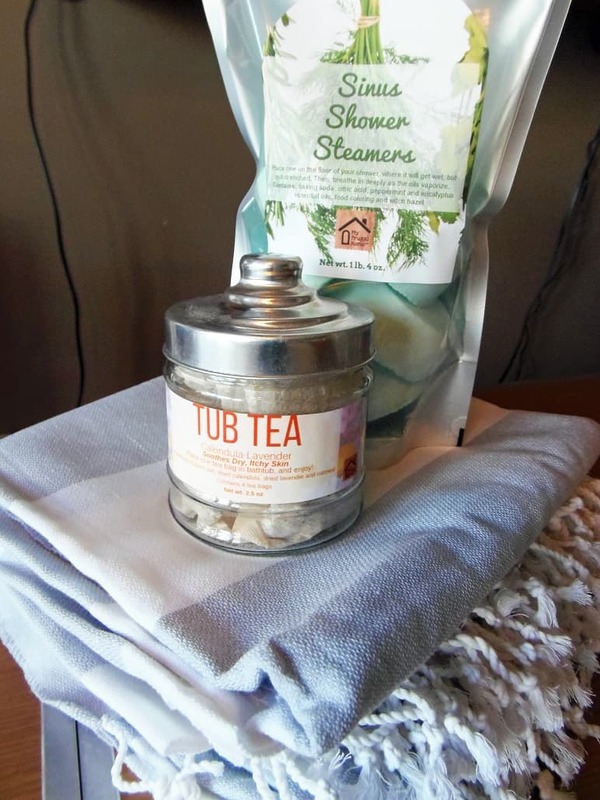 We gave my sister three turkish towels (new with tags from a church rummage sale for $3), a bag of my sinus shower steamers ($2.56) and a jar of my tub tea ($1.59). 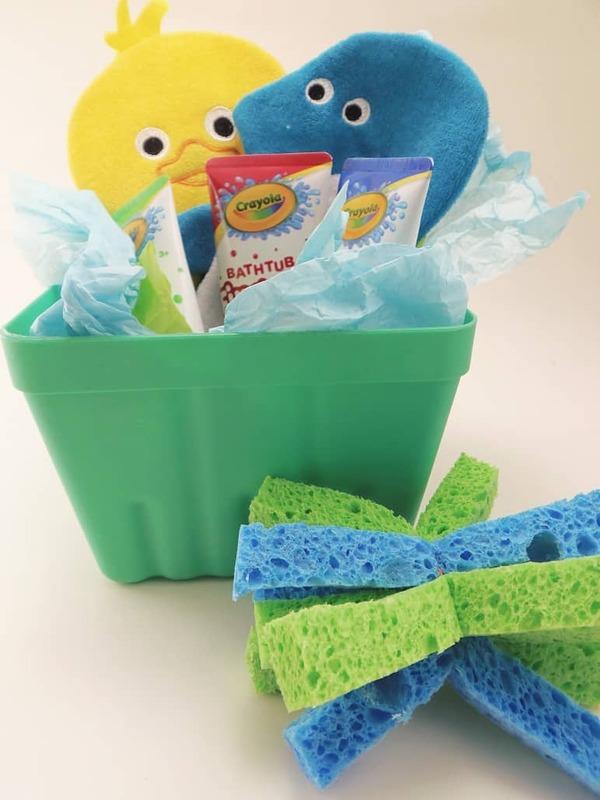 I put this bath gift basket together for my youngest nephew (he’s one). It has bath finger paints, two bath mitt puppets and one of those compressed wash cloths that expand when you put them in water. It also has a bath sponge “ball” that I made from a couple kitchen sponges. Everything came from the dollar store, except the gift basket, which I already had. This gift came in at $7. It’s one of my most expensive gifts this year, but with two older siblings, I didn’t think he needed more toys or clothes. So, while there are things I could have done that would have been cheaper, I feel like this is a gift that will actually get used, and that’s important to me. I decided to put together a collection of active toys for my nephew (5) and niece (6). This is what we gave my nephew. 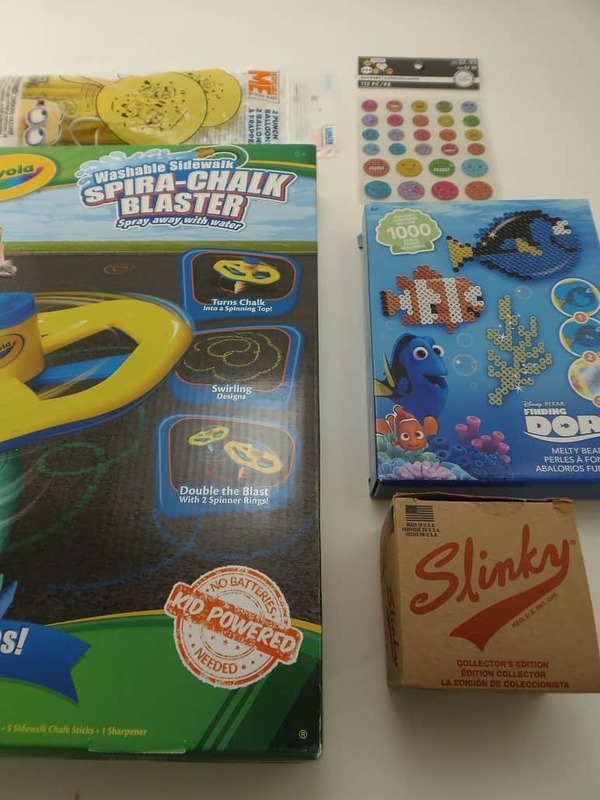 It includes a Crayola chalk spinner ($1 at a yard sale), a Finding Nemo Perler Bead kit ($.02 in a Michael’s grab bag), a metal Slinky (a regift), stickers ($.02 in a Michael’s grab bag) and two Despicable Me punch balloons ($.02 in a Michael’s grab bag). And here’s the gift we put together for my niece. 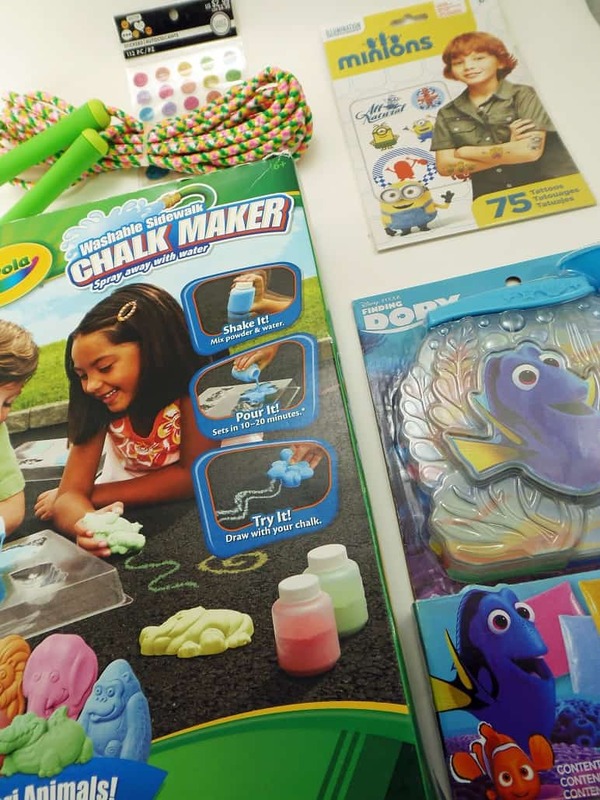 It includes a Crayola chalk making kit ($1 at a yard sale), a Finding Nemo sand art kit ($.02 in a Michael’s grab bag), a jump rope (a regift), Minion temporary tatoos ($.02 in a Michael’s grab bag) and stickers ($.02 in a Michael’s grab bag). 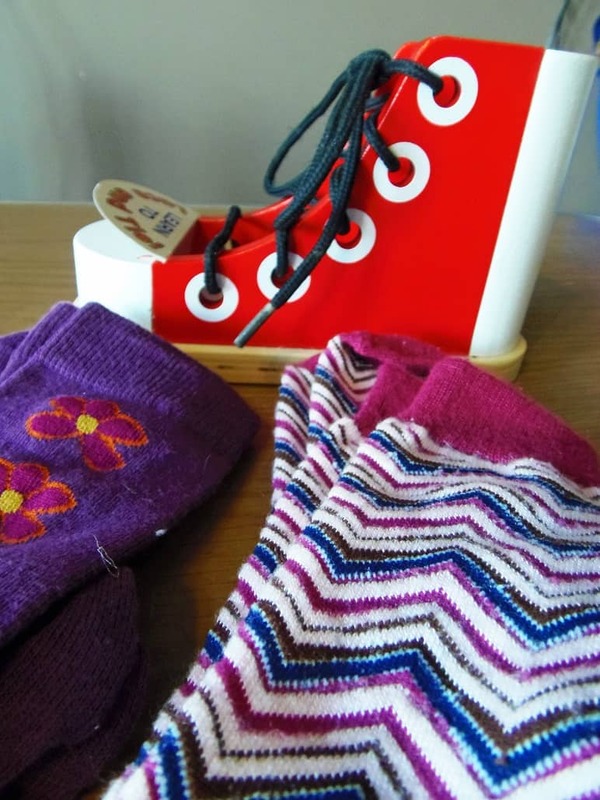 We gave our youngest niece (almost three) two pairs of knee socks ($.25) and a Melissa & Dough Wood Lacing Sneaker $1.50 at a thrift store). 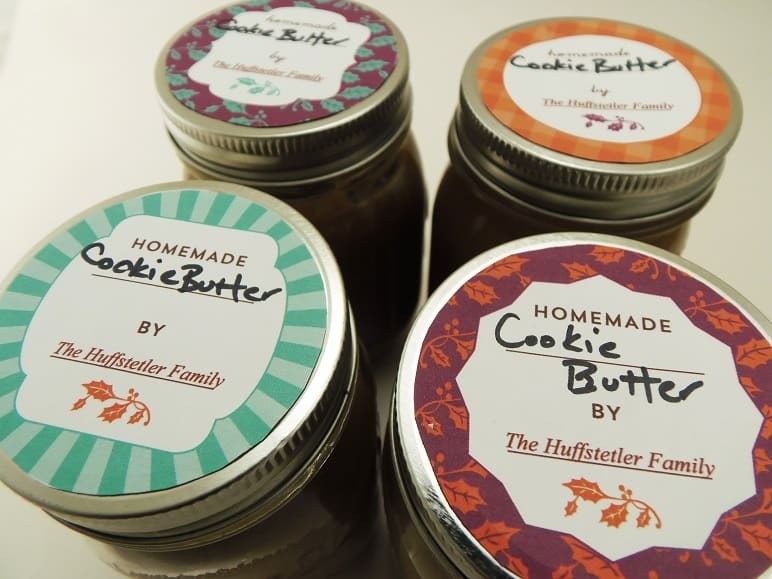 We gave our teenage nephews and my father-in-law each a jar of homemade cookie butter ($1.49 each). Here’s my recipe, and here are the labels that I used on the jars. 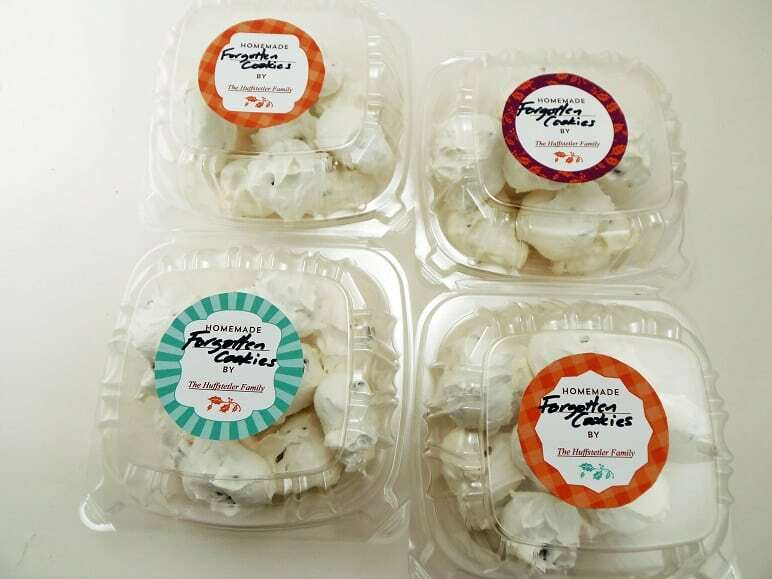 We also gave them each a box of chocolate chip meringue cookies (one batch cost $1.38 to make, and was enough to divide four ways. I’ll be sharing the recipe soon. 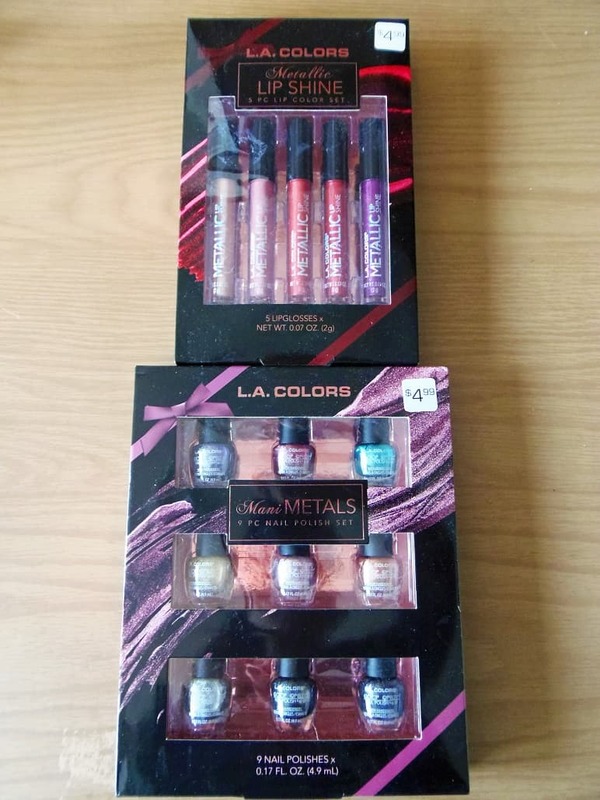 We gave our teenage niece (16) a nail polish set and a lip gloss set. Both were $.99 each after Extra Care Bucks during the CVS Black Friday sale. I used some points that I earned from another Black Friday deal to pay for them, so they were completely free. 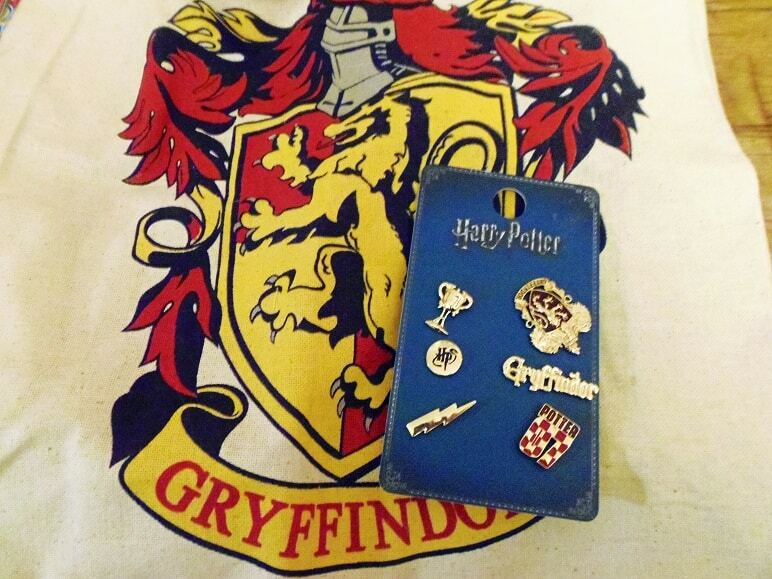 She gave one friend a Gryffindor tote bag and pins. These were regifts, so no cost. 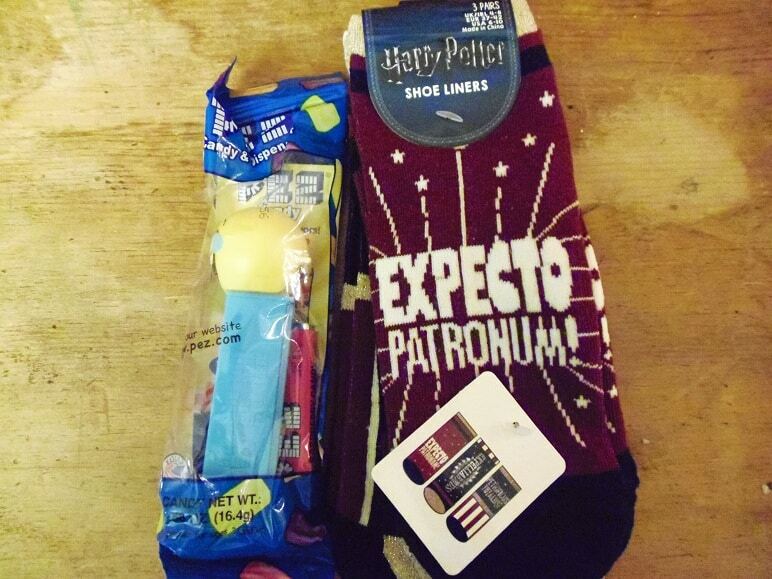 She gave another a pack of Harry Potter socks (a regift) and an emoji Pez dispenser ($.02 from a Michael’s grab bag). 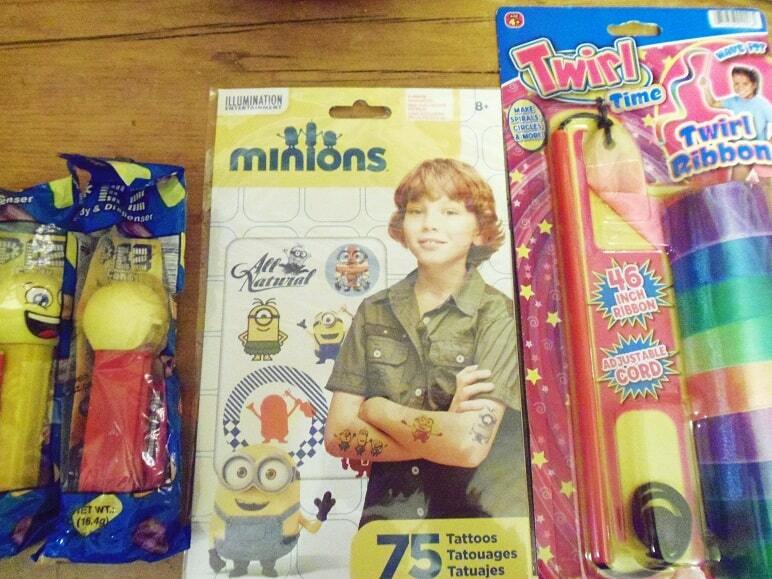 Still another received two Pez dispensers, Minion temporary tatoos and a twirl ribbon. 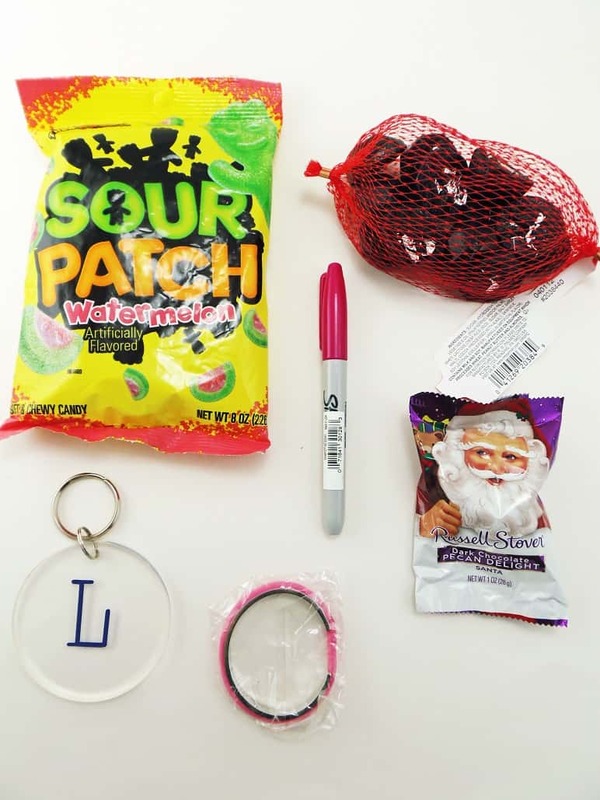 These were all items that came out of Michael’s grab bags, so the total cost for this gift was just $.08. 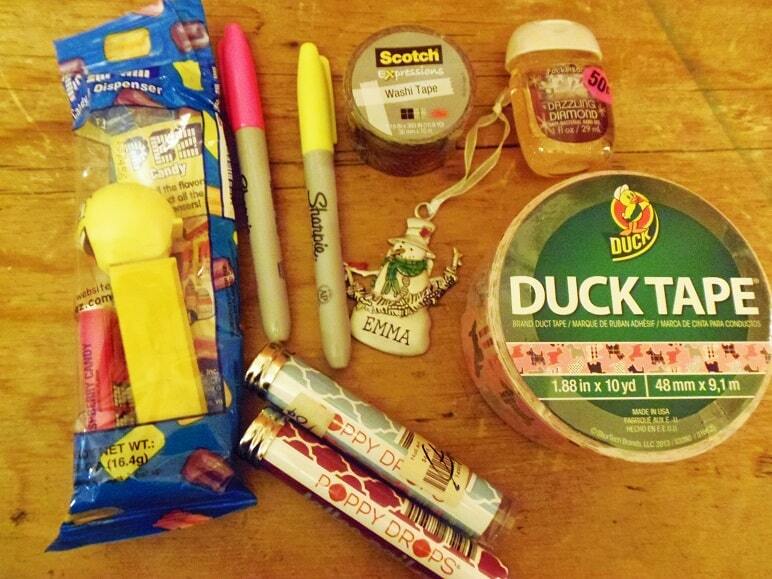 Yet another received a Pez dispenser ($.02), two Sharpie markers ($.10 each), nail art stickers ($.10 each at a church rummage sale), an ornament with her name on it ($.50 at Hallmark after Christmas), hand sanitizer ($.50 at a yard sale) and a roll of washi tape and Duck tape (Staples clearance items, paid for with rewards). And here’s what she gave her final two friends. 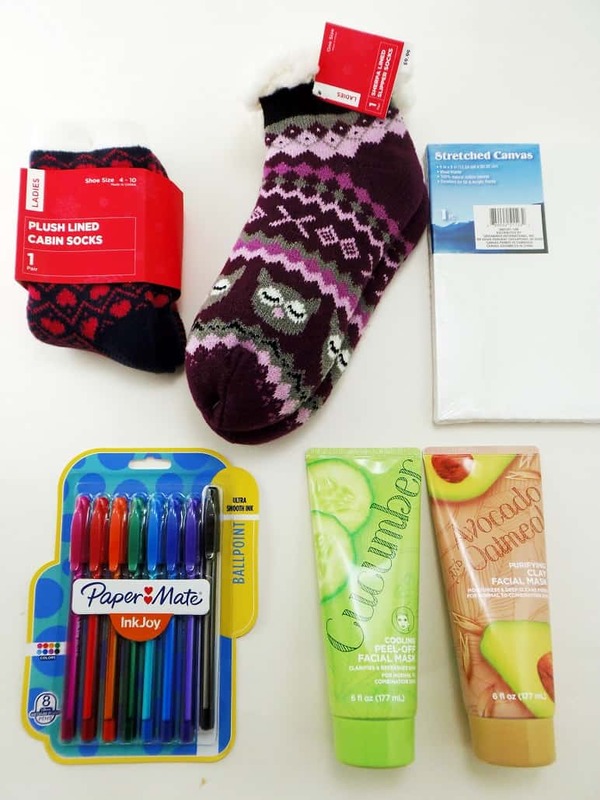 The items on the left went to one of them, and included: an emoji cookie cutter and two Pez dispensers ($.02 each in a Michael’s grab bag), a Sharpie marker ($.10 at a yard sale) and two rolls of washi tape (free after clearance and Staples Rewards). 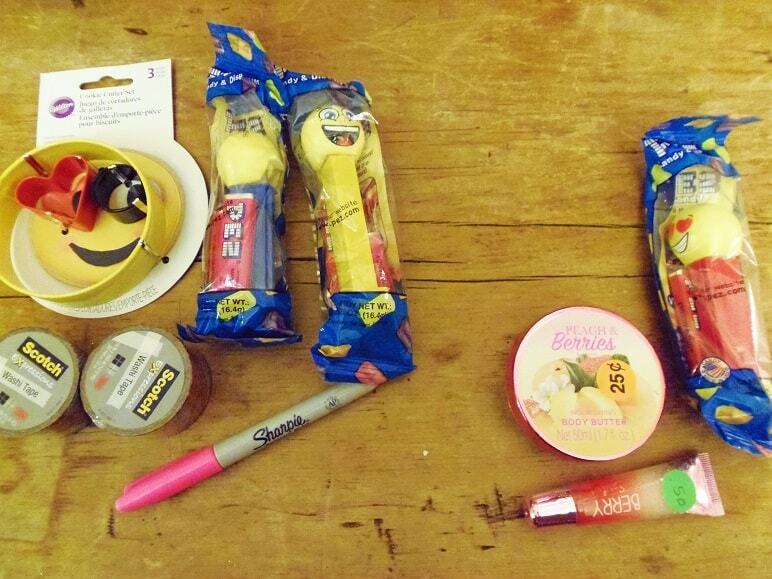 The items on the right went to the other friend, and included: body butter and lip gloss ($.25 each at a yard sale) and a Pez dispenser ($.02 from a Michael’s grab bag). So, the overall cost for her six friend gifts was $2. My oldest daughter opted to make or buy most of her gifts. She used a Walgreens photo code to make a photo book for one of her friends ($.92 after rewards). She used another photo code to print a free 8×10 for her boyfriend, which she put in a thrift store frame. And she bought a pack of small canvases from a thrift store, and used them to make paintings for a couple friends. All told, she only selected three items from the gift closet — two pairs of socks and a bath bomb kit. Those items added $1.50 to my total. We still haven’t exchanged gifts with a few of our friends, so I won’t show you those gifts just yet (since they read the blog). But I’ve already added the $2.80 that we spent to our total. That brings my grand total to $67.39. I’m really excited about the way everything came together, and can’t wait to see how it will come together next year. Want to See How I Pulled This Off in Previous Years? And if those aren’t crazy enough for you, check out the year I did Christmas for free. Want to Know More About How I Do Christmas for so Little? Here are the tricks that I use to get so many Christmas presents for free. This is always super inspiring, Erin. I see that in past years you’ve made spiral-bound notebooks for your daughters, and I’m assuming you own a spiral binder. If that’s so, would you mind telling me which one you have and if you’d recommend it? Thanks! I plan to make the girls notebooks again this year. I have some Girl Scout cookie boxes that I’ve been saving to make notebooks out of. They’re both long-time Girl Scouts. 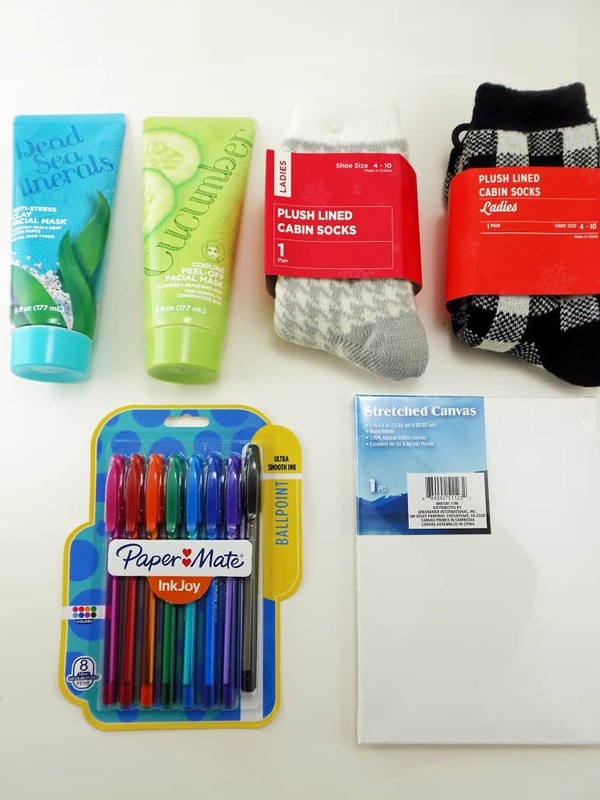 Would you consider writing a post about getting free samples, Amazon gift cards, and Office Max rewards that use to get gifts? Thank you. Check out this post: https://www.myfrugalhome.com/how-to-shop-for-free/ It covers a lot of the tricks that I use to get free Christmas gifts and other freebies throughout the year. I really am inspired to do this for next year. However, my family lives far any suggestions for shipping? So, we are minimal and I love the useable stuff so I will shop after Christmas for that kind of thing. I just get thrown off by giving gifts from the gift closet for birthdays. Is this $100 included for your husband’s budget as well? How much does he get for you? I usually have some gifts that I have to ship, too. I try to stay mindful of that when I’m selecting gifts, and do my best to choose things that are on the lighter side. Cuz it really pains this frugal girl when the shipping costs more than the gift itself. My parents live out of state, so we always meet them half way to exchange gifts sometime in December. I always hand off the gifts for my sisters’ families, since I know they’ll be seeing them later in the month. That helps, too. If you have Amazon Prime, one way to eliminate the shipping costs would be to focus on earning free Amazon gift cards throughout the year. Then, you could just have everything sent directly to the person for free. 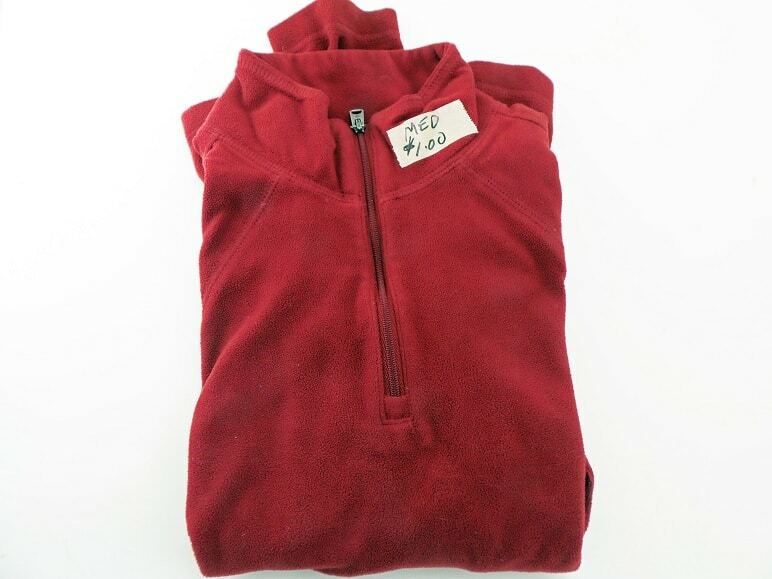 My husband’s gifts aren’t officially a part of my Christmas Under $100 Challenge, but I think if you were to total his spending it would still fit within that budget. He shops the way I do. He usually gives me four or five gifts, plus my stocking. Maybe next year I’ll include his gifts too, so you guys can see how he shops. What is your motivation for doing the $100 dollar Christmas every year besides you website? I’ve been doing my $100 Christmases long before this website existed, so that really isn’t a factor for me at all. I do it because it saves us money, and because it keeps our Christmases in check. I like that Christmas morning isn’t about opening a bunch of over-the-top gifts in our house. That’s had the effect of making my kids more appreciative of the gifts that they receive, and it’s made our whole family more thoughtful about what we give. A stand out for me this year is that my kids keep telling me they can’t wait for Christmas, not because they can’t wait to see what they got, but because they can’t wait for everyone to see what they got them, and to share the story of how they got it. That’s the kind of Christmas tradition that I want to pass on to my kids. 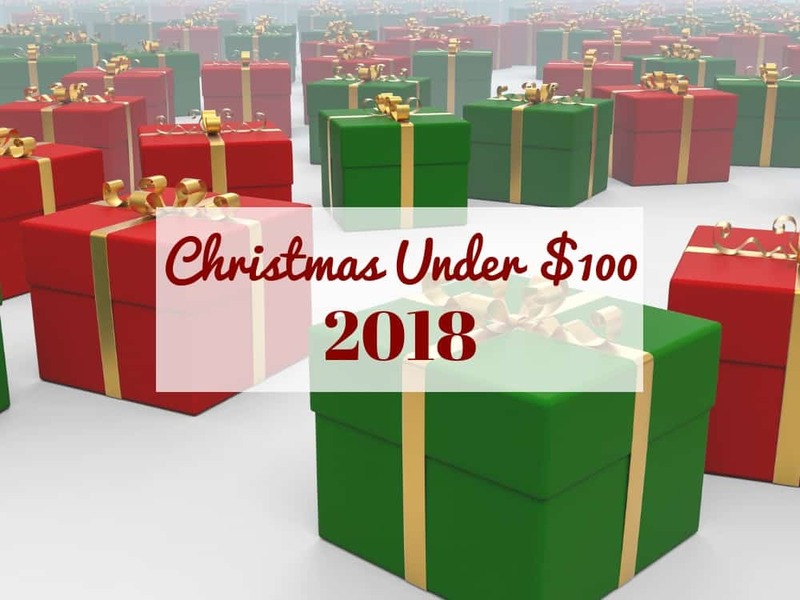 I started sharing my Christmas Under $100 Challenge on my website because I wanted to show people that there’s an alternative to the expensive, high-expectation Christmas that’s become so common. Celebrating Christmas the way we do is both meaningful and fun. That is impressive! Love, love, love this post! I have to try some of your ideas, although I do pick up freebies with my drugstore rewards. DH loves the 3 pk Planters nuts that I get from Rite Aid every year. I pay with rewards, so it’s always free. I do Christmas slightly differently. I mainly use point earning sites to earn gift cards, that I use to pay for Christmas gift. Is there an age that you cut off gifts for family members/friends/nieces/nephews? That’s actually something I’ve been contemplating lately because our oldest nephew is 19. I like the idea of cutting gifts off at 18. He has a younger sibling, so if we institute a new rule, I’m going to have to make sure I let everyone know that’s what we’ve decided to do. Was happy to see your final results! Awesome shopping as usual!